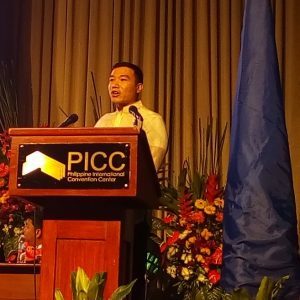 This was the opening of wealth expert, Vince Rapisura, in his message to 800+ graduates of ABE International Business College on May 17, 2017 at the Philippine International Convention Center. How do the estimated one million graduates ensure success in an economy of 6.6% unemployment rate%? “There are four ingredients”, Rapisura said. 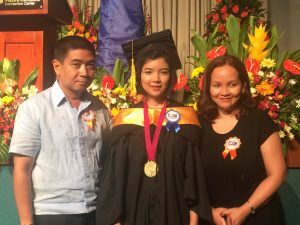 “Apat na K iyan – Kaalaman, Kakayahan, at Kakilala (these are knowledge, skills, and network). Graduates like Gabriel could take with them knowledge, skills, and network they got from their schools. ABE International Business College aims to produce not only leaders in the business world, but also techno entrepreneur professionals. These individuals are taught and trained to be responsive to the needs of the global community and to be strategic thinkers. When one enters the workforce he or she should take the advantage of widening one’s knowledge, skills, and network, especially in one’s field of interest. Rapisura, who had a knack for entrepreneurship at an early age, got employed first to familiarize himself of the ins and out of the industry he wants to put up a business in. 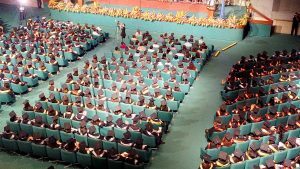 Rapisura encouraged graduates to seek financial freedom. By age 31, even if he stopped working, he was already set. He is currently 38 years old. Part of Gabriel’s plans was to save up for her future. This can help her with emergencies but not with her retirement. With below 0.25% interest rate in regular savings account, her money will have less value in the future given the current inflation rate of 3.4%. So how did he Rapisura do it? Passive income are earnings even without working. Examples of passive income are dividends, interest income, capital gains, rental gains, royalties, and pension. Parents have a role in guiding their children in handling their finances. 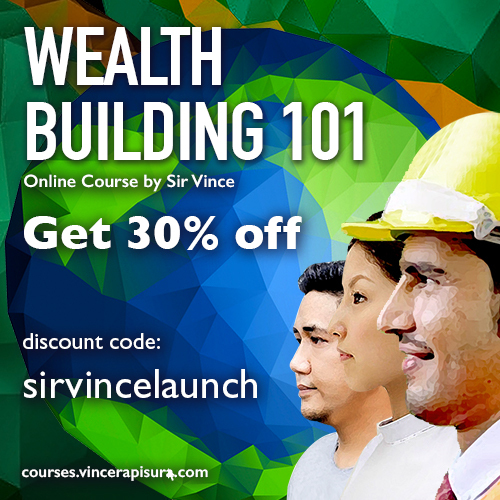 Vince Rapisura is a graduate and currently a teacher of Ateneo de Manila University. He also took his Masters in Entrepreneurship in Asian Institute of Management. He is the Founder and President of SEDPI, a group of social enterprises that are into training research, consulting, financing, publishing and real estate development. Read Rapisura’s personal finance guidebook entitled “(L)Earning Wealth: Successful Strategies in Money Management”. Watch his online talk show, “Usapang Pera,” with various celebrities in. Follow Vince Rapisura on Facebook, Instagram and Twitter.. You may also send your email at info@vincerapisura.com or ask a question on messenger.